Wi-Fi Next Steps: 802.11ax or 802.11ac? To get started, ask yourself these six questions. With a new wireless standard ready and available, 2019 unwraps a wireless conundrum as 802.11ax solutions take their place in the market. You may also hear about Wi-Fi 6, which is just the new nomenclature used by the Wi-Fi Alliance (instead of 802.11ax) in the effort to simplify the naming convention. With a hat tip to iOS, this nomenclature is pretty familiar to mobile users so there’s a good chance we’ll see Wi-Fi 7, 8, and 9 in years to come. For the sake of consistency in our comparison of the two standards discussed here, I will refer to the new standard as 802.11ax. Outside what to call the new standard, Aruba and others have introduced APs that leverage the new performance capabilities of 802.11ax. The new Wi-Fi standard includes some clever engineering that improves performance and saves battery life, but it may not be the right choice, nor the only option, to meet the needs of your midsize organization. As the upcoming year unfolds, mobility will be central to most organizations’ growth and success, so it’s good to know which wireless standard aligns with your business needs. Breaking out the ins and outs of 802.11ac and 802.11ax can turn into tech talk fast. What you really need to know is which one is best for your 2019 plans—and beyond. 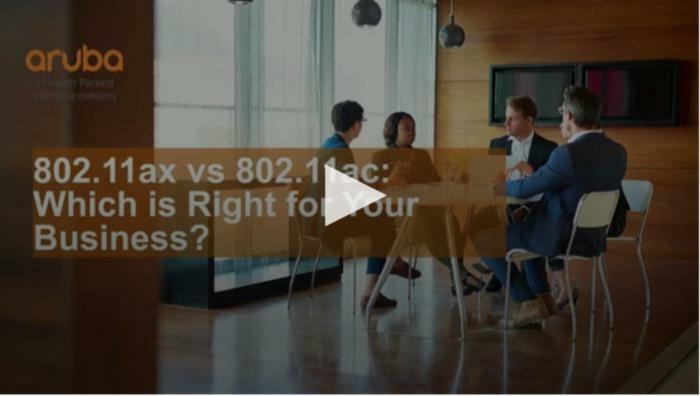 To get started, ask yourself these six questions to better understand the impact 802.11ac and 802.11ax can have on the future of your business. Do you have an IoT project on your horizon or already in production? A lot of the feature improvements in 802.11ax were designed with IoT in mind. If you are among the manufacturers, restaurants, automotive, or other organizations that want to use IoT sensors for predictive maintenance or another proactive business needs, 802.11ax is built for the unique demands of IoT traffic. In 802.11ax, Orthogonal Frequency-Division Multiple Access (OFDMA) increases user data rates and reduces latency, especially for large numbers of devices with short frames or low data-rate requirements. OFDMA is particularly effective in raising network capacity in IoT environments. Whatever your IoT project is—operational management, campus safety, or patient monitoring—802.11ax is staged to outperform 802.11ac in these environments. Are you planning to build a network for a complex environment? Complex environments have always presented a performance challenge for Wi-Fi. In 802.11ax, new features will improve performance and capacity for shoppers, students, or mobile workers who access the network on the go. Retailers will find this useful to support video-based kiosks and IoT applications like security monitoring, as well as mobile commerce applications in RF dense environments. Large event venues, such as stadiums and student commons, will also provide higher bandwidth to a larger number of users on an 802.11ax network. Are you trying to minimize complexity? Both options, 802.11ac and 802.11ax access points, can be supported by a best-in-class, cloud-managed platform that will help you simplify day-to-day management activities and lower the cost of your overall network implementation. At the same time, all Aruba APs are flexible enough to be managed on their own in independent clusters or by an on-premises management platform. 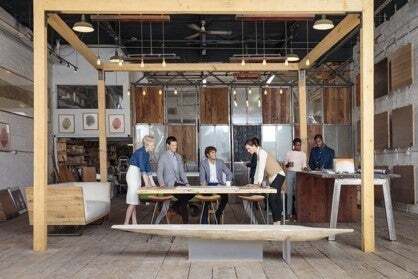 Whatever Wi-Fi architecture you choose, you’ll find a full set of features in Aruba 802.11ac and 802.11ax solutions that support scalability, fast deployment, easy monitoring, and built-in security. The great news is that both standards are backwards compatible, and will support clients based on previous 802.11 standards. Are you forecasting network growth in terms of traffic, users, or locations? In most cases Wi-Fi users and apps are growing, not decreasing. Analysts forecast that there will be as many as 30 billion connected devices in 2020. The traffic from those devices, especially video traffic, which is expected to have an 45% annual growth through 2023, could make WLAN performance unacceptable to employees, guests, and customers. If your roadmap has wireless usage in growth mode, you’ll need the increased throughput (4x that of 802.11ac) of 802.11ax. IEEE built features into 802.11ac and 802.11ax to accommodate the increase in traffic, users, and locations, but 802.11ax will deliver better performance. Multi-user Multiple-Input, Multiple-Output (MU MIMO), for example, is a multi-user capability, originally introduced in 802.11ac. It improves network capacity by allowing multiple devices to transmit simultaneously on the same channel by splitting spatial streams (communication paths), optimizing the amount of throughput capacity available on the access point. The newer 802.11ax improves on 802.11ac by increasing the number of users that can communicate at the same time, allowing more efficient operation. Not every organization’s mobile roadmap will need these performance gains. Organizations that have a small number of devices, don’t expect growth, support local applications, have limited use of video over wireless, and/or have budget restrictions will be well served by 802.11ac. And with the right cloud-based network management platform, you can move to 802.11ax or other future standard when the time is right without losing continuity in the overall network architecture. 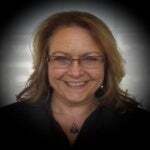 Are you looking for more ways to improve customer experience? Retailers, airports, universities, sports complexes, and anywhere large numbers of mobile users are on a WLAN will appreciate a new power-saving mode in 802.11ax. Instead of the battery drain that happens now as mobile phones continuously search for a wireless network, newer 802.11ax devices connecting to an 802.11ax network will conserve their battery life. In 802.11ax, the AP tells network client devices the exact time they should communicate, a feature referred to as target awake time or TWT, allowing them to put their Wi-Fi radios to sleep during down time to conserve power. This improvement can dramatically reduce Wi-Fi power consumption and extend battery life. Basically, users won’t have to scramble to recharge their phone, and you have one more tool in your arsenal to keep customers happy while they are shopping, waiting for a flight, or watching a basketball game. Similarly, productivity devices such as handheld scanners, tableside ordering tablets, and mobile point-of-sale devices will also last longer on a charge, increasing operational efficiency. Does your business like to have the newest, fastest wireless technologies? If you like to be on the leading edge, 802.11ax is for you. You’ll get some performance and capacity improvements that are not available in 802.11ac. If you are ready to take the plunge, products like the AP-510 Series from Aruba, are available today. Something to note, while some of the throughput improvements may apply to legacy devices, only 802.11ax client devices will exercise the full potential of the new standard. For now, 802.11ax devices aren’t available and won’t be until mid-2019. When weighing the price premium on 802.11ax you’ll want to think about how quickly you will have a predominantly 802.11ax client environment to take advantage of these performance improvements. You should also mention that they need to consider their next refresh lifecycle. This blog touches on a portion of what you need to know to make smart wireless choices for 2019. You can learn much more about 802.11ac and 802.11ax in this interesting, no BS webinar that I hosted. In less than 60 minutes you’ll get an excellent overview of these two technologies and a better understanding of how they can improve the perception of your WLAN.